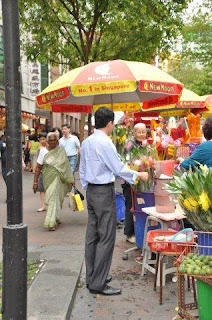 Yesterday afternoon, as I was waiting for my luggage to arrive, I scouted online for some things to see in Singapore. I ran across a very brief comment about a temple here that was on someone’s MUST DO WHILE YOU ARE IN SINGAPORE lists. 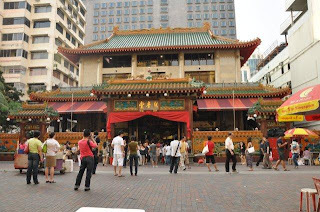 It was the Kwan Im Thong Hood Cho temple on Waterloo street. It was mentioned that wishing something in here makes the wish come true and that there is a fairly complicated process for paying your respects here (at least complicated for the uninitiated, like me). I made a mental note to check it out at some point and then called a cab to take me to Bugis Village. After walking through the mosh pit market I found myself on, what I thought to be, a quieter, but still quite populated, part of the market. And then I literally looked up and discovered I was right in the presence of the temple I had just read about. I sat and watched what people did on the outside of the temple for a while before deciding I would go in myself. I did not see a single other westerner approach the temple at any time…but something inside me was dying to go in and see for myself. I went to a woman selling lotus flowers nearby and purchased one that I assumed would be an offering of some sort. The flower was so beautiful that I wanted to take it home. I have never seen a lotus flower in person before. As I entered the outer vestibule of the temple, I followed everyone else in picking up joss sticks (an incense stick) and walking over to the fire to light them. A kind man there, who was lighting his own sticks) literally lifted mine away from the fire and told me in the sweetest voice that I needed three, not two. That only three would bring me the luck I needed. I thanked him and brought a third back and he showed me the correct way to light them and, once they lit, told me to hold them and how to pray and place them before entering the temple. Which I did. I did not realize at the time that I was praying to Quan Yin. Once I had placed the burning joss sticks into the sand in front of the temple, I entered tentatively. The place had hundreds of people, inside and out. A stunning golden statue of Quan Yin stood at the back of this temple behind a wooden counter filled with flower pots. I followed everyone else to the front, bypassing the large red carpet positioned in front of the goddess on the floor…filled with prostrate worshippers. Here I am. Clearly a clueless westerner, and this kind woman offer to teach me what to do. I remove my shoes and kneel as she instructs in broken English. “Now you pray, in your heart, to her. Tell her what you want and what you want to know. She will answer you.” And pray I did. Being in a room with so many clearly faithful people fills you with a reverence that is hard to define. Their prayer was intense and focused. Their hearts were reaching out to this goddess of mercy. I felt her there. I did not have a problem praying to her. Once I felt sufficiently connected, my guide in the process instructed me to shake the box until only one of the sticks fell from it. This is more difficult than it sounds and, while other more accomplished worshippers completed the task in moments, it took me some time. Finally I felt the motion and a stick dropped out on the floor before me. I gathered my things, as instructed and headed to the same counter where I had picked up the sticks in the first place. I handed them the stick that had dropped before me and they handed me a piece of paper with the goddesses words for me. The counsel I got was perfect, but less important than the entire process had been for me. I walked out and crossed the street to sit on a wall and witness the people coming out. I had stumbled into another world and I was not quite ready to return to the bustling mayhem of Bugis Village. I took the only picture you are allowed to take of the temple, which is outside…but the statue of Quan Yin is etched in my brain. She was that beautiful… infused with the wishes and dreams of millions of devoted who had bowed before her. I felt lucky to have been a part of this. The details I share here are really not sufficient to deliver the impact of the experience of entering a place of mercy, a place packed with the faithful and being gently guided through the process of seeking your own answers. I believe I got mine in the faces and love shown to me in the process. This entry was posted in magic, travel, work by kimcambron. Bookmark the permalink. You wrote so well about this. What a wonderful experience. That was beautiful Sis. I'm glad that you got to experience it. She seems to be marvelous. Thank you for sharing.